It’s generally accepted that a house with children has good reason to be untidy. But while there will most certainly be moments of messiness, life with kids doesn’t have to mean household chaos. 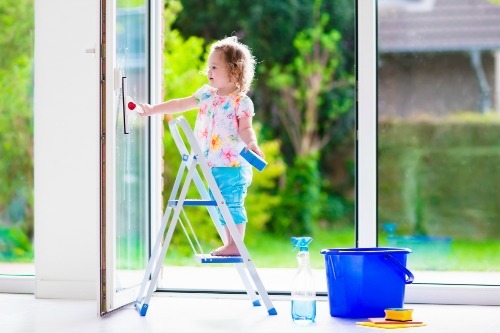 Children of all ages are perfectly capable of helping out with the upkeep of the home – and not only does this help ease your burden, but it helps them to build positive skills and habits for the future. Here are some great ways to get your kids to help out around the house. Make it a natural part of their routine. Doing housework doesn’t always need to feel like work. Teach your children that after they eat, they bring their dishes to the sink. Reinforce that when they put on their pajamas, dirty clothes go in the hamper. Instruct them that when they brush their teeth, the sink gets wiped down. Children thrive on routine, and integrating good housekeeping habits with their everyday practices will make your job infinitely easier in the long run. Sure, you know that housework is work. But your kids haven’t learned that yet. For them, it’s still fun to push the vacuum, spray cleaner on the windows, and wipe down the mirror. Use this to your advantage and use language that reinforces the privilege of doing housework. Instead of saying, “You have to….” say “Guess what?!? You get to…” in order to keep things fun and exciting. It’s hard for a child to comprehend that they have to clean an entire room before they’re finished. It’s simply overwhelming. Set a timer to break up the task. “You just need to pick up these toys for 10 minutes. When the timer goes off, you’re done!” It’s much more manageable for a child to work for a short period of time than to tackle a full task to completion. Make your expectations clear to your child, and give them specific directives. “Start by putting your princess dresses in the dress-up box. After that, find all the cars and put them in the car bin. Next, find all your shoes in the living room and set them neatly on the shoe rack by the front door.” Children can be easily overwhelmed by the multitude of tasks that come with tidying a home. Break them up into simple, manageable tasks and dole them out one by one to your child. By having one task at a time to complete, they will feel successful multiple times over during the cleaning-up process. Ask what they want to do. Children always have opinions, and it doesn’t hurt to ask them which task they’d like to tackle. Give them a few options (that they can reasonably handle on their own) and let them choose which one they’d like to do. Get them their own cleaning supplies and tools. Kids love having a sense of ownership. If you’re regularly including your kids in housework, make sure you have tools and products that they can use – and that you feel comfortable letting them use. Mix a vinegar solution in a spray bottle for a non-toxic cleaning solution. Give your child a mop with the telescoping extensions removed so it’s not too big. There are even functional kid-sized vacuums if you’re so inclined. Including them in the process will not only make them feel special, but will also help you out. Be realistic about what you’re asking of your kids (these are some great guidelines). They probably don’t have the dexterity to wash the dishes and clean their little siblings baby bottles to your satisfaction, but they are perfectly capable of unloading the utensils from the dishwasher and sorting them into the drawer caddy. Have high expectations, but don’t expect perfection. Be realistic about what you’re asking of your kids and focus on their successes. You might have to do a little finish work to get the cleanliness up to your standards, but be thankful that at least they got the task started. The truth is you don’t have to do it all around the house. While it might seem like more work to get your children on board with some of the regular housekeeping tasks, the reality is that it will help relieve your load and teach them responsibility at the same time. Enlist your children to help you keep the household chaos at bay and the end result will be a happier mama and conscientious kids. I think we can all agree that’s a win-win for everyone. A big thanks to Jenny for guest posting today! Jenny is just another mom trying to do her best. She loves making lists and helping others find what they are looking for. She enjoys sharing the latest parenting tips & hacks as well as the struggles and triumphs of feeding her baby on her blog – Mom Loves Best and Pinterest.